Hello ladies and gents. Today I’m bringing it old school. At 23 am I even allowed to say “Old School”? 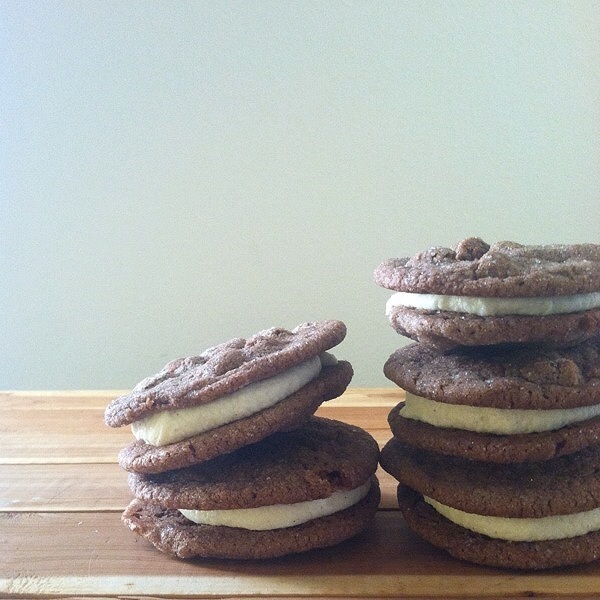 Anyway, today I’m making my own twist on a kid favorite with grown up cool: Chocolate Cookie and Vanilla Cream Sandwich. It doesn’t taste 100% like an Oreo because it’s not. It’s got the look and the aura of an Oreo but it’s much better. One thing I cannot emphasize more is that when you buy quality products you get quality flavors. Now when you buy quality it doesn’t mean expensive it means it’s not imitation vanilla extract but vanilla paste, or when you buy Unsweetened Cocoa Powder instead of Sweetened. The depth of flavor these items give is bar none amazing. So I strongly encourage you guys to buy the good stuff at a good price, and since your just beginning with these products there’s no need to buy the big stuff, a little container will be perfect. Now about the cookies; aren’t they darling! I let the vanilla cream be just that, vanilla cream. Butter, Vanilla, and Powdered Sugar. It doesn’t get any more original or better. If you like the taste of vanilla add more, if you want your cream a certain sweetness then add more or less powdered sugar, but don’t put white sugar in the cream, we don’t bake the cream so the white sugar will leave a grainy texture and taste whereas the powdered sugar (sifted of course) leaves a smooth texture and even flavored taste. On to the cookie, this cookie is just your normal but not normal average but not average chocolate cookie. 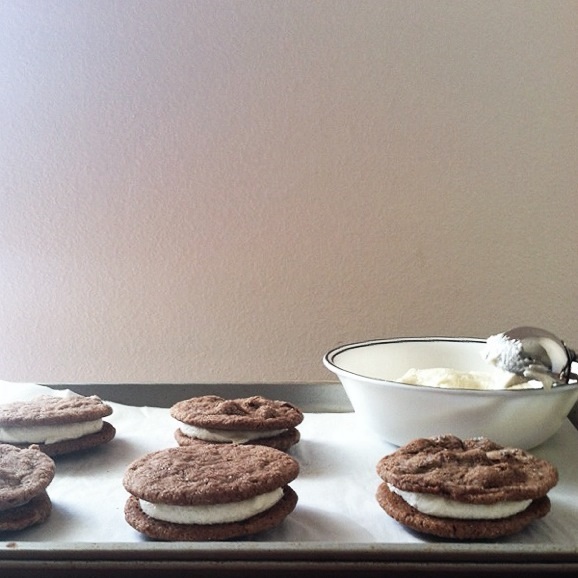 It’s a homemade cookie and we all know those are better and it’s sandwiched with vanilla cream so you know its even better. Side-note: you want these cookies to cool down all the way before filling it with the cream, butter can melt easily and you don’t want a curdled mess, so be patient. Also, if you have one, use an ice cream/cookie scooper. 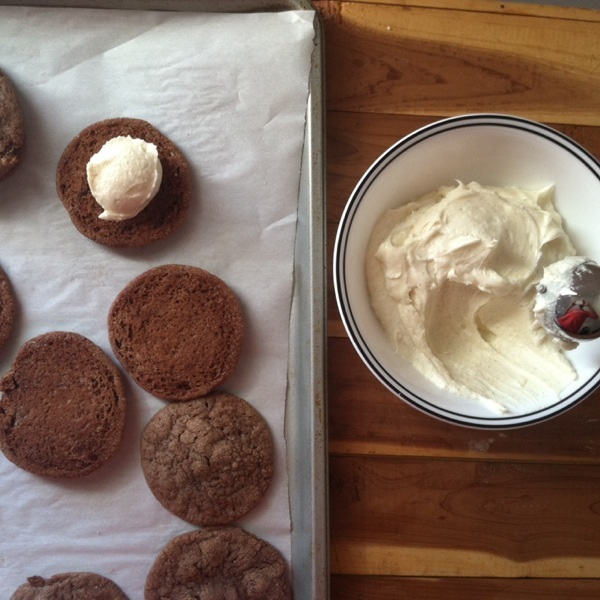 You want the same amount of cookie and the same amount of cream. My cookie scooper is fairly small so everything comes out small yet even. Well I’m sure you guys would like me to stop ranting and get on to the recipe. Some alterations you could make is make a berry frosting. Chocolate and berries go very well together, you simply just mash your berries and cook some of the liquid out on the stove, once cooled you add to the cream and proceed to making a cookie sandwich. You could also make the frosting chocolate as well if you want a massive chocolate dessert/snack. Just be creative when you bake and I hope you all enjoy this treat. In a large size bowl, cream together with the hand mixer the butter, milk, melted chocolate and sugar until they are light and fluffy. The mixture may still seem a bit grainy but that’s all fine. 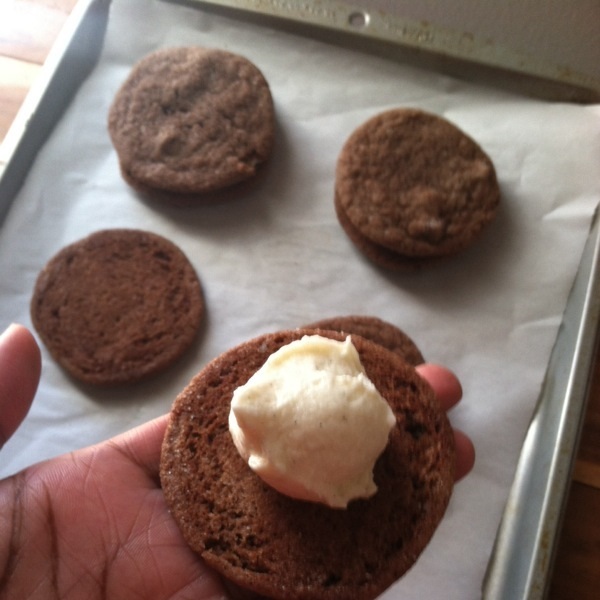 I encourage using an ice cream/cookie scoop since these will be sandwich you want them to be the same size, if you don’t have an ice cream/cookie scooper then a kitchen spoon or tablespoon measuring cup will be fine, just roll it into a circle ball to make sure they’re somewhat uniform. Bake for 7 – 10 minutes, leave the cookies in the pan for another 5 minutes outside of the oven and the place them on a cooling rack. While the cookies cool, proceed to making the filling. In a medium size bowl with your hand mixer, mix your butter, milk and vanilla paste until combined. When I made this the butter mixture was still somewhat stubborn and refused to spread out like when you cream sugar and butter, so if your mixture does this as well don’t fret it will turn out all peaches and cream. Slowly add the powdered sugar. I suggest adding it in slowly and mixing between adds until it gets to a texture your satisfied with. All people are different so some might want theirs stiffer while others would want it looser. Also make sure to taste the filling, you don’t want it to end up too sweet, so make sure to taste in between additions as well and also add your salt to taste. If needed add a bit more, but not too much! You don’t need the filling to cool in the refrigerator so it’s good to start your filling process right now. 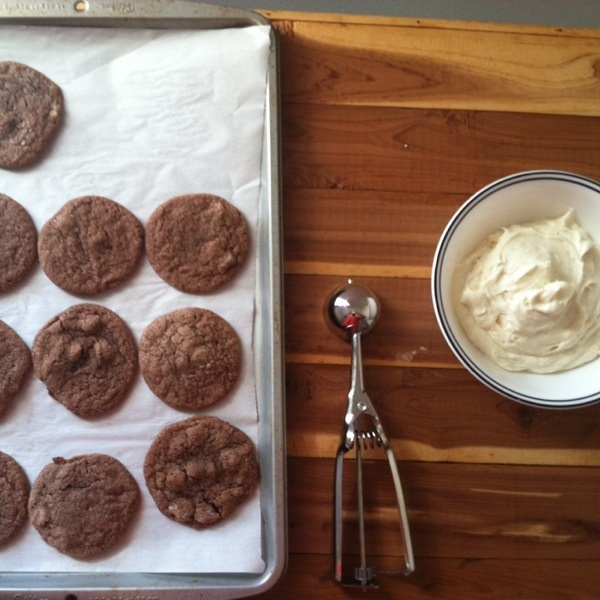 Once again I suggest using an ice cream/cookie scooper as you may want unanimous amount in each cookie. One scoop was enough for me but some may want more or less. 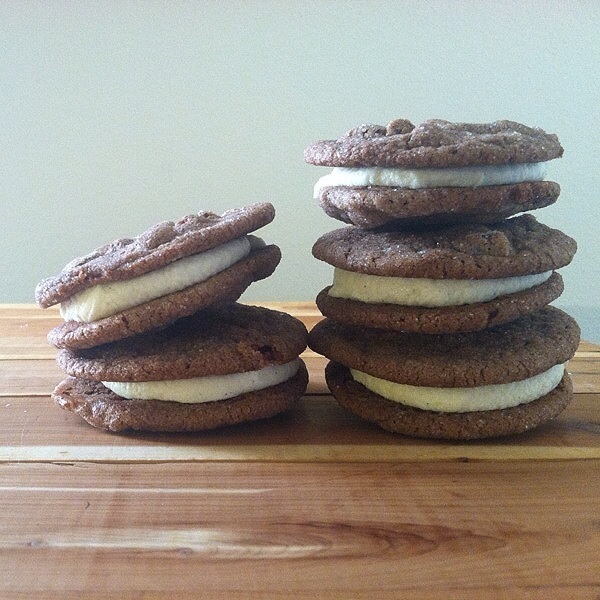 Depending on how much filling you use for each cookie you may end up with extra filling or need to make more. (If you already know you’re an extra type of person, like my mother for example, I would suggest just making an additional half or whole batch while making the original. Save yourself some time! Now it’s time to eat! Unless you’re a hard cookie sandwich person, then put this bad boy in the fridge for about 15 – 30 minutes and then you eat these in the back of the closet where no one can see and judge you.